The use of donor apoptotic cells is an emerging therapy for inducing transplantation tolerance. 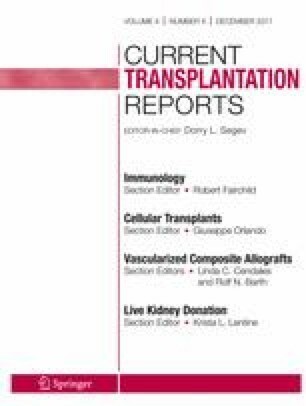 In this review, we will discuss current understanding of mechanisms of this approach, as well as crucial aspects necessary for successful translation of this approach to clinical transplantation. Transplantation tolerance by donor apoptotic cells is mediated by their homeostatic interaction with recipient phagocytes and subsequent expansion of suppressor cell populations as well as inhibition of effector T cells via deletion and anergy. To ensure their tolerogenicity, it is critical to procure non-stressed donor cells and to induce and arrest their apoptosis at the appropriate stage prior to their administration. Equally important is the monitoring of dynamics of recipient immunological status and its influences on tolerance efficacy and longevity. Emerging concepts and technologies may significantly streamline tolerogen manufacture and delivery of this approach and smooth its transition to clinical application. Hijacking homeostatic clearance of donor apoptotic cells is a promising strategy for transplantation tolerance. Timing is now mature for concerted efforts for transitioning this strategy to clinical transplantation. This work was supported by grants from the National Institutes of Health P01 AI112522 (A.D.), U01 AI102463 (X.L. ), and R01 EB009910 (X.L.). A.D. and X.L. conceptualized and wrote the manuscript. X.L. edited and finalized the manuscript. Kang HK, Wang S, Dangi A, Zhang X, Singh A, Zhang L, et al. Differential role of B cells and IL-17 versus IFN-gamma during early and late rejection of pig islet xenografts in mice. Transplantation. 2016; https://doi.org/10.1097/TP.0000000000001489. Song S, Tan J, Miao Y, Li M, Zhang Q. Crosstalk of autophagy and apoptosis: involvement of the dual role of autophagy under ER stress. J Cell Physiol. 2017; https://doi.org/10.1002/jcp.25785. Solhjou Z, Uehara M, Bahmani B, Maarouf OH, Ichimura T, Brooks CR, et al. Novel application of localized nanodelivery of anti-interleukin-6 protects organ transplant from ischemia-reperfusion injuries. Am J Transplant. 2017; https://doi.org/10.1111/ajt.14266.